I have Skyvector email me the GPX file, I then download it to my downloads folders on my Nexus. 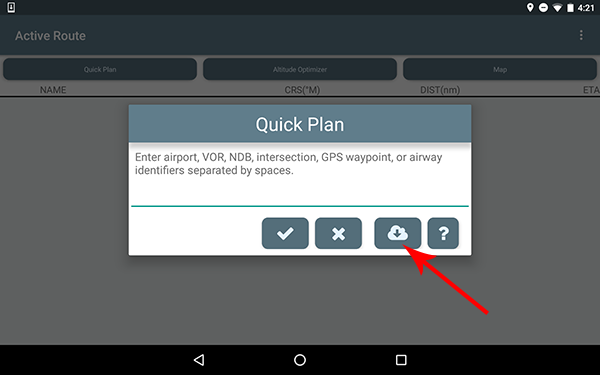 If I go to the Quickplan screen and click the Cloud icon as shown in the image below, it imports properly. If I goto the Load Route screen, then click Import, top right, select GPX, Naviator then crashes after selecting the GPX file without delay. Still love the app, great for me as a renter. I have seen this problem also. It will duplicate and forget off the top of my head what I did differently to make it not crash. There are two ways to import and one of the ways crashes and the other works. Same problem, importing from either the load route screen or the quick plan cloud import - results in Naviator crashing. Is there any solution coming up for this, appears to be an old problem. many thanks. I experienced the same as checkgear, was able to do Quick Plan Cloud. .gpx from FlyIQ.